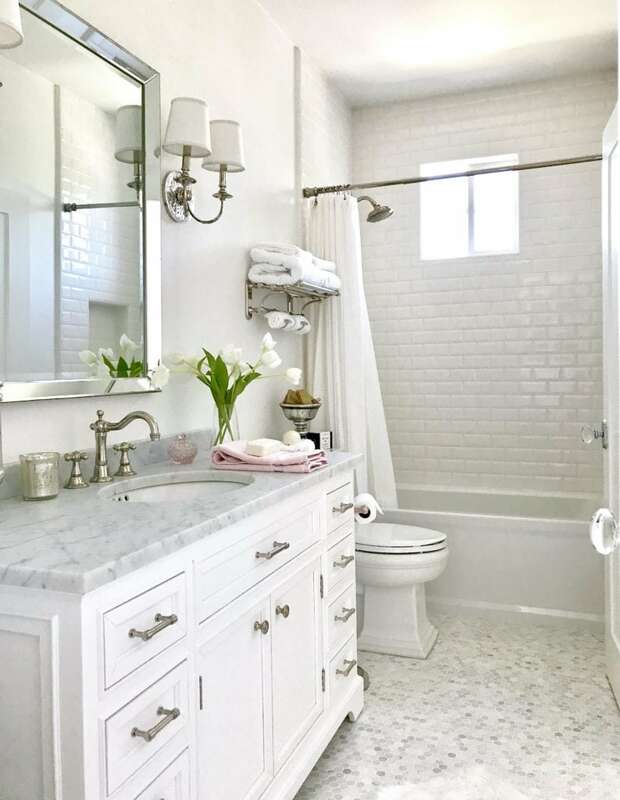 In this post: If you’re thinking of a bathroom remodel, this compilation of master bathroom inspiration underscores the beauty of white marble tile. Well, truth be told, I was ready since the day we moved in. But finally, I think hubby may be ready too. Or at least giving in. I’m talking, of course, about a master bathroom remodel and it’s something I’ve wanted for two years. When we bought our home, it was only about 5 years old, so it was not in “need” of a remodel. The layout is fine and this will be strictly cosmetic, but it’s been a priority of mine since the purchase and in fact something we talked about before buying. I don’t feel guilty or spoiled because it was a precondition for selecting this house. Above is the starting point – what the room looked like when we moved in. I immediately re-painted and have since removed the large mirror and builder’s grade lighting, replacing them with brass and crystal sconces and gilt framed medicine cabinets. But apart from that, it still looks exactly like this. Now if you’ve seen my kitchen renovation, you probably have an idea of the direction I’m headed in. In a word… white! And lots of it. The two key things I’ll be working on are new tile and a new vanity. Of course, that will involve new faucets and hardware, as well, but I likely won’t be ripping out the tub because… budget. And while I do love the way pedestal tubs look, I actually use my tub a lot and love having space around it to put things like candles, flowers and speakers. So at this early planning stage, I’ve pulled together some of my favorite images for renovation inspiration. The sources are all linked below so please click on the photos for details on these spaces. Many of these belong to my favorite bloggers so you’ll find detailed information if you click over to their posts. And if there’s one recurring theme you’ll find in almost every one of them, it’s white marble tile. I’m crazy in love with white marble and I hope to include it as a key ingredient in our master bath. Let’s take a look at how it’s used in these stunning baths. 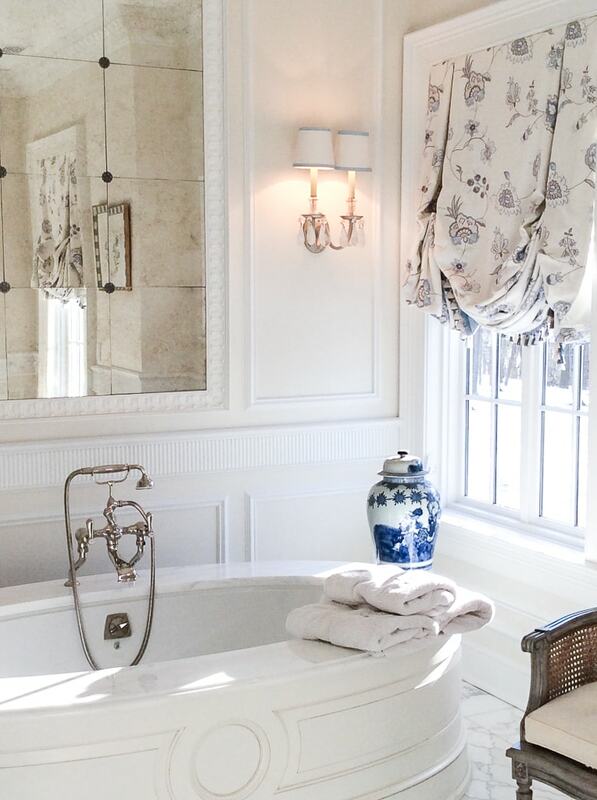 This master bath from The Enchanted Home embodies a lot of the elements I repeatedly gravitate toward, from the white marble floor and tub surround, to the gorgeous moldings and hints of French decor in sconces, window coverings, chinoiserie jar and cane back chair. 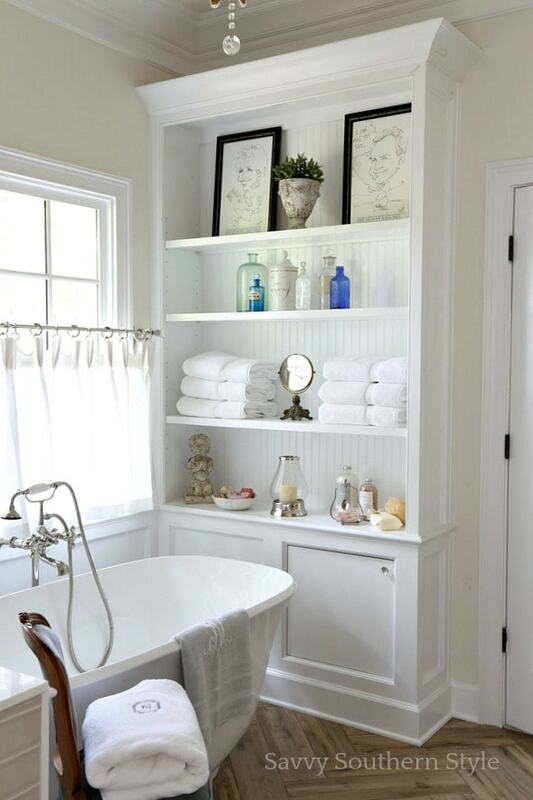 White towels and vintage inspired tub faucet complete the look. One of my absolute favorite bath renovations, this one above from Courtney of French Country Cottage is crazy gorgeous! 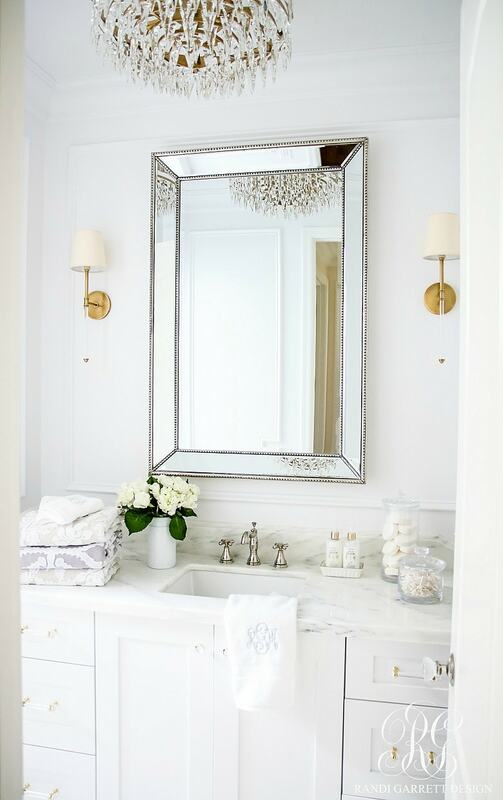 The mirror and sconces and table converted into vanity make it oh-so-special, but most applicable to my upcoming reno are the brass bridge faucets and stunning marble wall tile. 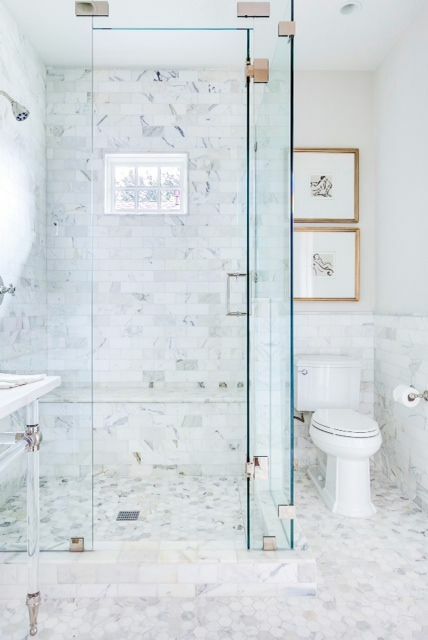 While there’s technically no white marble in my friend Kim from Savvy Southern Style’s recent master bath remodel pictured above, it’s nonetheless exquisite and retains the same spirit with it’s top to bottom clean white lines. 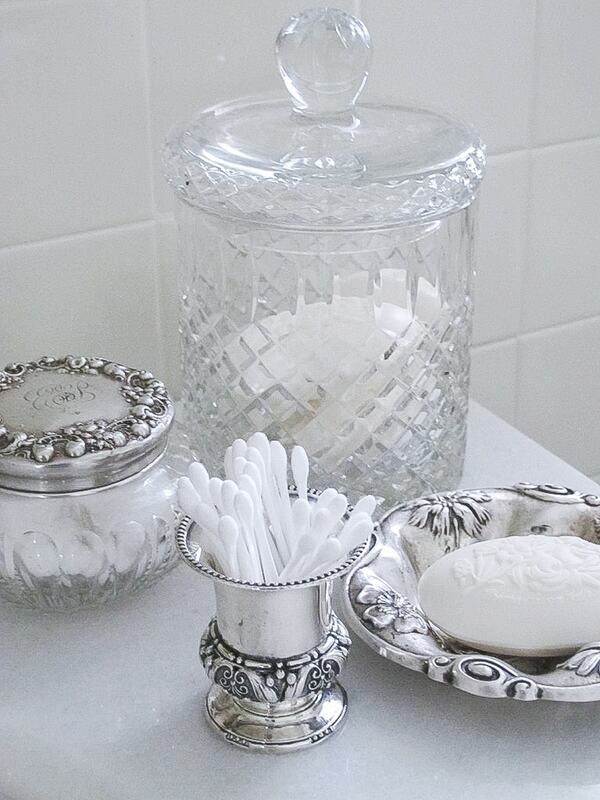 There are lovely materials used and I encourage you to see the entire space, as she’s used beautiful details on the vanity on the other side of the room. 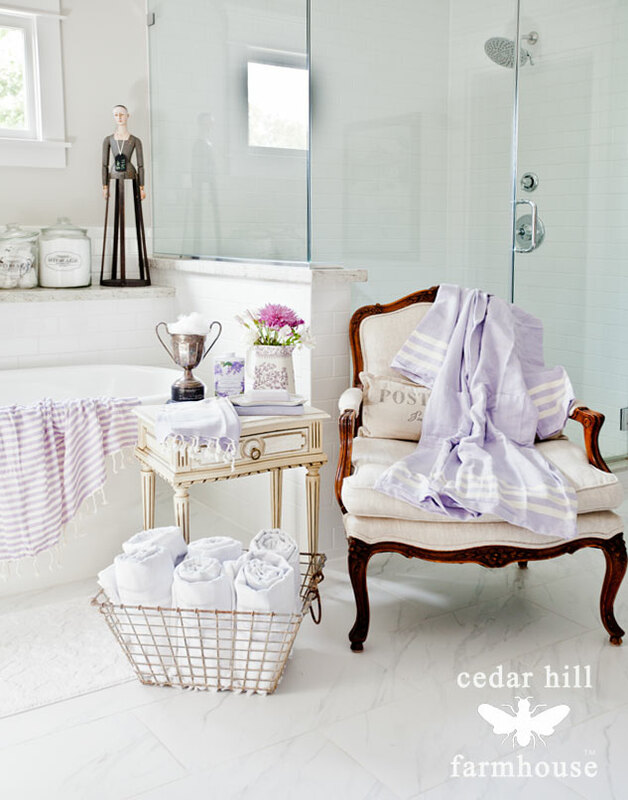 So much of Anita from Cedar Hill Farmhouse’s gorgeous French bath owes its character to the accessories in the space, most notably the sinewy fauteuil chair and the pretty table beside it, but the underpinning of subtle white marble tile adds so much to the room and provides the perfect backdrop to her unique styling. 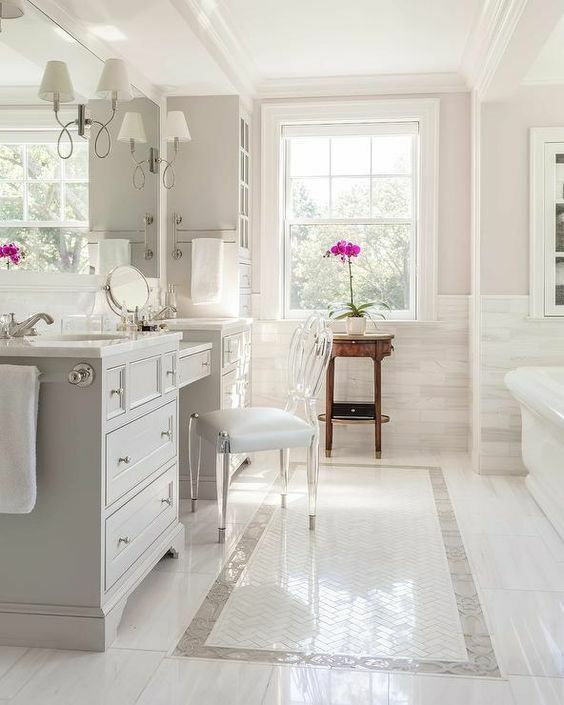 This wonderful bath featured by Hooked on Houses is a vision of stunning white marble tile, from subway shaped wall tile to the hexagons used on the floor. Sleek glass doors look great and the simplicity of design lets the rich materials do all the talking. I’m not sure what most enamors me here in this gorgeous space from PHX Architecture.The brilliant polish of the floor and its herringbone patterning adds character and interest. The clean lines of the tub contrast the more fluid look of the French bench, but the mix is perfect. I simply love an alcove, and this one from Mark Williams is pure bliss. 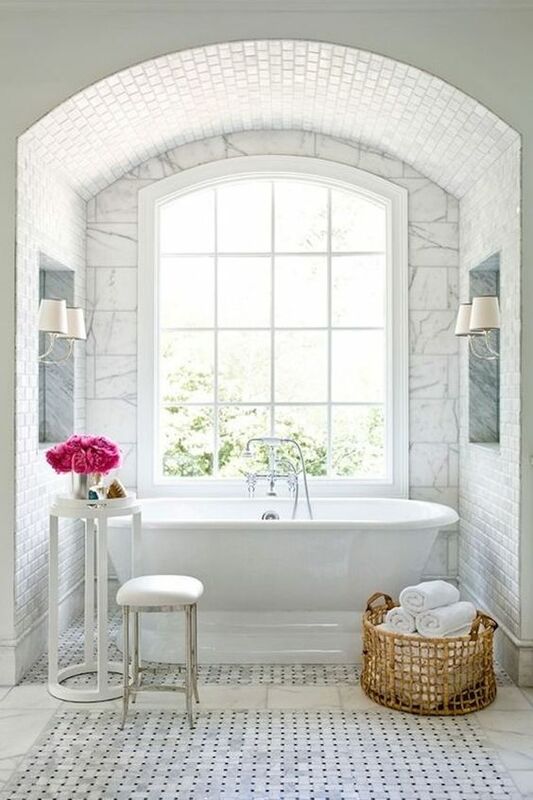 The mix of marble tiles is perfect and the varied clean white elements add to the spa vibe in this bath. Not even a master bath, this guest bath from Kristy Wicks is remarkable in its adherence to perfection. 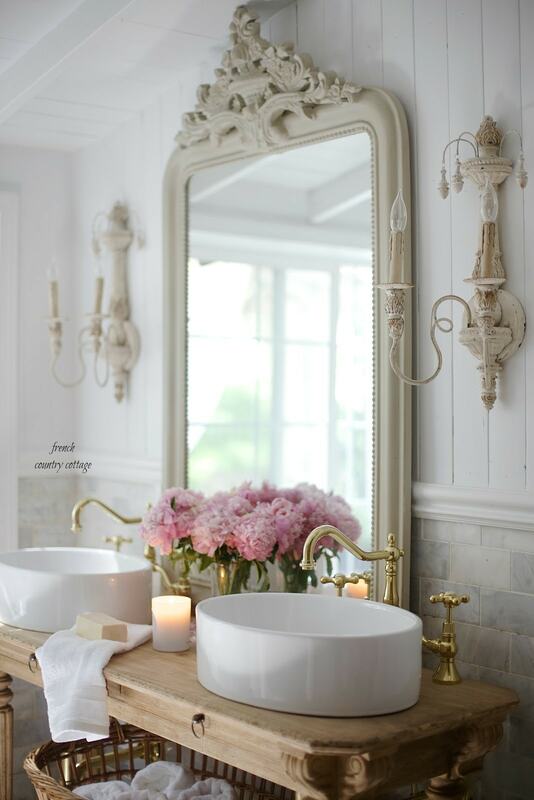 The vanity is one of my faves, and I’m enjoying the beveled subway tile, as well. This image from Stagg Design offers what could be my top choice for marble wall tile. The exaggerated size subway tile is lovely and the use of brass hardware really knocks it out of the park. There so much interest in this image found at Curated Interior, despite it appearing virtually monotone. 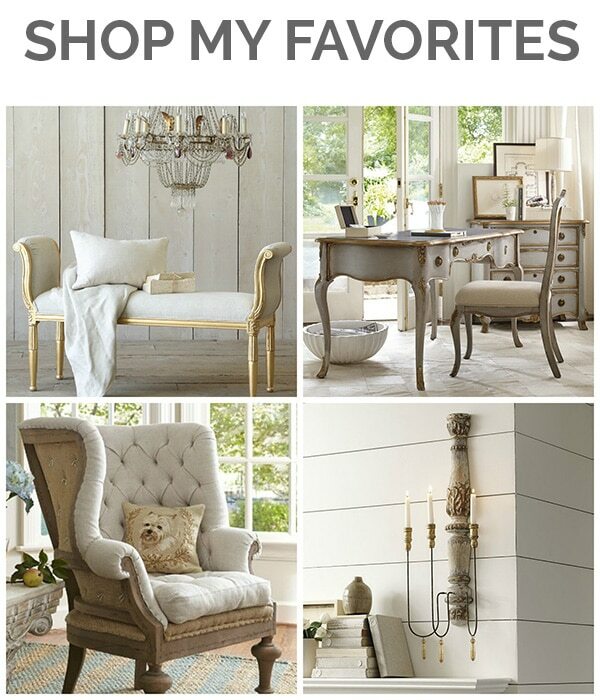 Instead there are many shades that work well together and lovely French details abound. 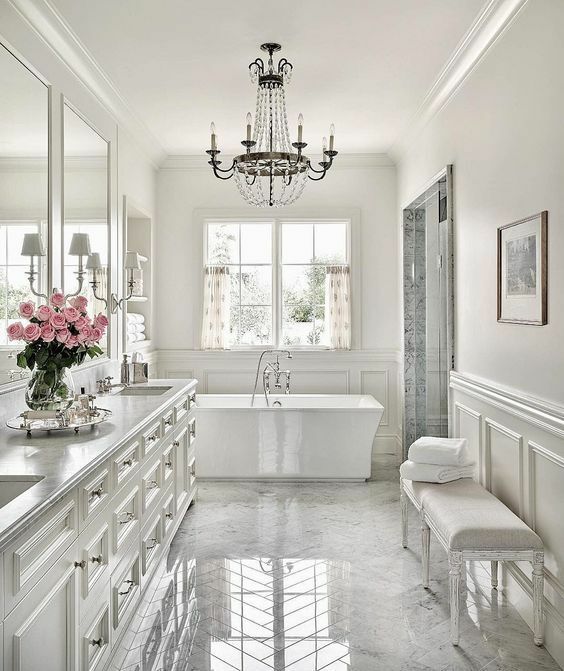 This photo from Luxe Source alone almost convinced me to rip out my tub and I’m loving so many of the details from the elegant vanity to the polished marble floor. Roman shades, furry vanity stool and a fabulous fixture top it all off. Another blogger friend, Randi from Rangi Garrett Design did an amazing job with this bath above. The marble counters are absolutely beautiful and enhance the lovely styling set across its expanse. Lighting and a beaded edge mirror add the finishing touch to this wonderful space. I’ll be starting to look for tile soon and the ideas here will act as my guide. While they all are exquisite, each one is remarkably unique. I’m excited to start this project and can’t wait to share the progress as we go! Yeah, marble is a classic that’s pretty hard to beat. We’ll be waiting with bated breath to see what you do. All so beautiful! Looking forward to seeing what you decide on and the progress of the project. 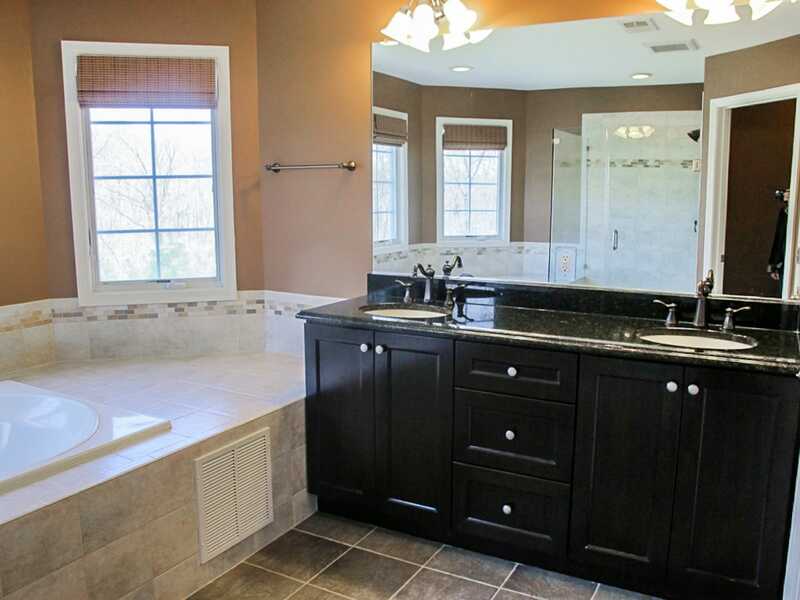 I remodeled my master bath about 12 years ago when in my Tuscan phase. How I wish I’d gone with white marble. Oh, the pain! Love these inspirations! Looking forward to seeing what you end up doing! The bath from Luxe Source is my absolute favorite! Absolutely beautiful! I do like a white bath with white bath linen, especially monogram linens. All so beautiful!!! Wing confined to the bed in our master suite for most of the last 9 weeks, I have redecorated the bathroom about a million times in my mind! This just makes me want to explore about a million more!!! Lory, I just know your bathroom redo, as with everything else you’ve done, will be nothing short of amazing! I loved seeing all the pictures. They’ve given me some great ideas for our guest bath remodel, but that will have to wait until we change other more pressing areas in our home, probably two years from now–fun to dream about the changes in the meantime. Hugs! Wow, a lot of beautiful ideas in this post. Someday, I hope to be able to design a gorgeous bathroom like one of these. I especially want a shower with a bench!! haha. Thanks, Lory for the shout out! I sure hope you get your dream bathroom soon! They are all so gorgeous. I am dreaming of a bathroom remodel and if so lucky it will have marble. Each of these is gorgeous and the one from PHX Architecture really caught my eye. We’re long overdue for a main bath and powder room renovation and you’ve given me lots of inspiration. Looking forward to yours! These must be the most gorgeous bathrooms I’ve ever seen. I love all the gleaming white!